Today, we’re kicking off Killer Robot Week with a bit of a forgotten sci-fi feature: 2000’s much maligned “Red Planet,” which features the killer military tracking robot AMEE. “Red Planet” was directed by South African Antony Hoffman, and is to date the director’s only feature. He did a short in 2014, but has no other planned credits listed on IMDb. The best information that I could find indicated that he apparently does commercials these days, which I suppose is better than nothing. A fellow named Chuck Pfarrer is listed as both the writer and a producer on “Red Planet,” and it has been his only credit in the new millennium. Previously, he had an assortment of writing credits on movies like “Hard Target,” “Darkman,” and “The Jackal.” However, his most telling credit is on the film “Virus,” just one year prior to “Red Planet.” Back to back high-profile, high-budget failures in consecutive years is just about what it takes to sink a career. 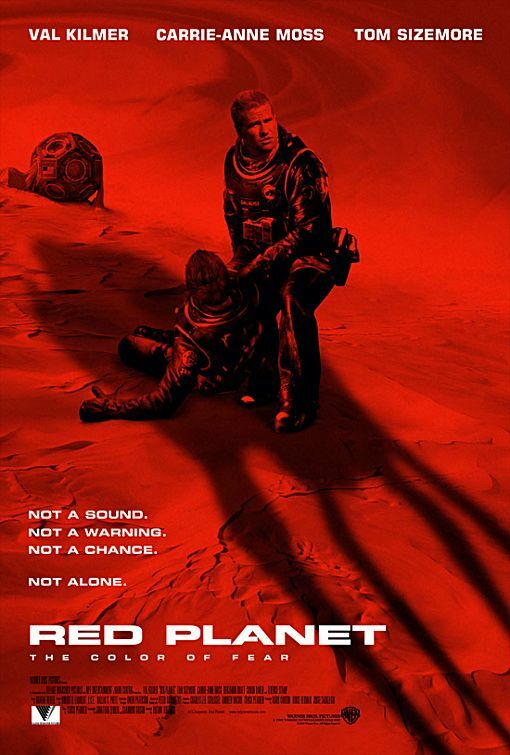 “Red Planet” boasts a pretty interesting cast: Simon Baker (“The Mentalist”), Val Kilmer, Terrence Stamp, Carrie-Anne Moss, and Tom Sizemore lead the way in a minimal cast of astronauts who are sent to investigate a Mars terraforming project. Apparently, a lot of creative shooting had to be done with stand-ins and body doubles due to a major feud between Kilmer and Sizemore on set, which led to numerous instances where they refused to be present together for filming. First off: I definitely agree on (most of) the effects. 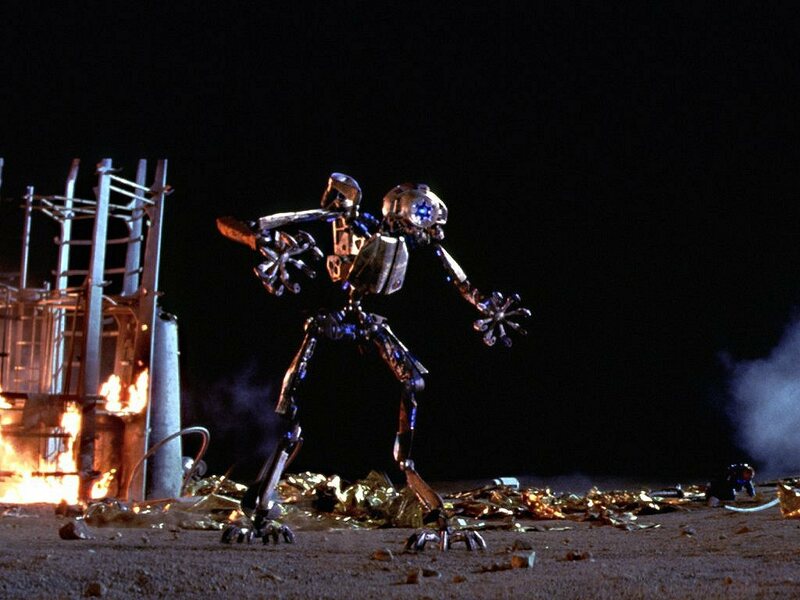 AMEE, the killer robot of the story, is primarily done with CGI, but looks absolutely fantastic for being from 2000. Some other things in the story look less impressive (the oxygen bugs), but AMEE is undoubtedly the centerpiece. Speaking of which, the design of AMEE is damn cool. The monoeye design of the infamous HAL is incorporated into a complex, impressively thought-out convertible robot that functions in both bipedal and quadrupedal modes. I’m not a big fan of the kung-fu bipedal mode, but the quadropedal mode is really unsettling: AMEE’s motions are modeled after those of large, predatory cats, and the sense of cat-and-mouse in the plot is really punched home with that detail. It is also worth pointing out that some of the most recent robotics developments at Boston Dynamics bear some resemblances to AMEE’s quadropedal mode, which is interesting to see. Another bit of sci-fi technological foresight here is the inclusion of a helicopter drone on AMEE, a solid year or so before the recognized inception of the modern UAV program in the United States military and CIA. …they used spinning wheels on the ship to simulate gravity, which would work. I was amazed to see two wheels, spinning in opposite directions. This is exactly what you want to do! I did like this movie. While not action packed, I liked the pacing and the thoughtfulness of it. There were a few plot devices: (1) the gamma flare (2) why didn’t the military disable AMEE’s military mode before giving it to civilians? and (3) the bugs making oxygen. However, this is a factor of ten fewer plot devices than in most movies. …it is my great pleasure to say that “Red Planet” is vastly better than “Mission to Mars”. Of course, the stomach flu is better than “Mission to Mars”. That is pretty high praise coming from Plait, who is quite the stickler in the realm of depicting science accurately on screen. So, why was “Red Planet” such a huge failure? One of the most common criticisms I saw of the film over a cursory glance of the Rotten Tomatoes critics blurbs was a perceived lack of originality, a complaint that I think justifies some context. Another criticism of the film I have seen is the perceived lesson of “faith > science”, arguing that the movie has some concealed Luddite tendencies. I mean, there is a killer robot and a lot of wayward technology, so I can definitely see where that criticism comes from. There are also some painfully cringe-inducing lines of dialogue about faith that just feel strange and out of place: I have to wonder if this popped out of a rewrite or something, because the moments seem to pop out of nowhere, and don’t really contribute anything to the story. Val Kilmer’s extreme Christian Scientist beliefs have popped up recently in the news, proving that he is almost certainly devout to a fault as far as his personal health is concerned. I’m a little curious if he had any sway on the inclusion of these lines, which isn’t something that would be unheard of. In any case, they are a distraction and a weakness to the movie if you ask me. There isn’t anything strictly wrong with “science gone too far” stories, but it didn’t quite work here. I thought the more interesting line to follow would have been the “Jurassic Park” ‘life finds a way’ route, given that life manages to pop up despite all of the odds against it on Mars. Oh well. “Red Planet” would have been a great 1950s science fiction film. It embodies the kind of nuts-and-bolts sci-fi championed by John W. Campbell Jr. in his Astounding magazine–right down to the notion that a space mission would be staffed by research scientists, and although there would be a woman on board, she would not be the kind of woman depicted in an aluminum brassiere on the covers of his competitors. This is a film where much of the suspense involves the disappearance of algae. Feels a lot like a B-movie from the 1950s. As far as the plot goes, I appreciated the bit of mystery element included around the terraforming. It reminded me of the similar mechanic used recently in “Interstellar,” which I think served well in that film as well. I wish that the oxygen bugs made a little more sense and some more time was spent on it, but the tension wasn’t ultimately built on that mystery when it comes down to it, so that might have been the right decision. “Interstellar” put weight on saving Earth, whereas there isn’t the same urgency with “Red Planet”: these astronauts are just trying to survive. I mentioned a few members of the art and production design team earlier. I specifically read into them, because the work on this movie is nothing short of fantastic. I love all of the gadgets, the equipment, the ship, the set: all of the trim in this film is top notch without a doubt. 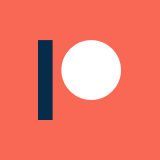 Everything seemed vaguely futuristic, but not so far that it was beyond belief: that can be hard to pull off in sci-fi, which I think any creative futurist could tell you. The near future is tricky business, because you are never quite sure when/where the big technological jumps are going to come in. As I mentioned before, I think “Red Planet” merits a pretty solid “C,” but I’m still going to recommend it, if only because this deserves a second, retroactive look by more people, unpolluted by the context that surrounded its release. Also, the visuals of the robot and the production design are just cool, and are worth giving it a watch alone.